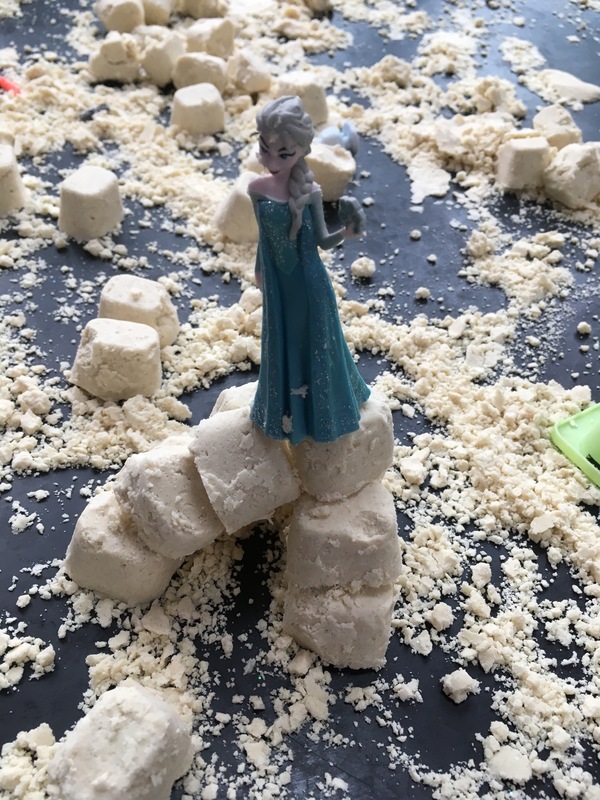 Snow dough is surprisingly like snow – you can mould it enough to make balls etc, but it’s also quite crumbly! We used pipecleaners for arms, eyes, nose and buttons. Bobcat really enjoyed filling the tray and tipping them out. I showed him how to use them to build walls and an igloo. 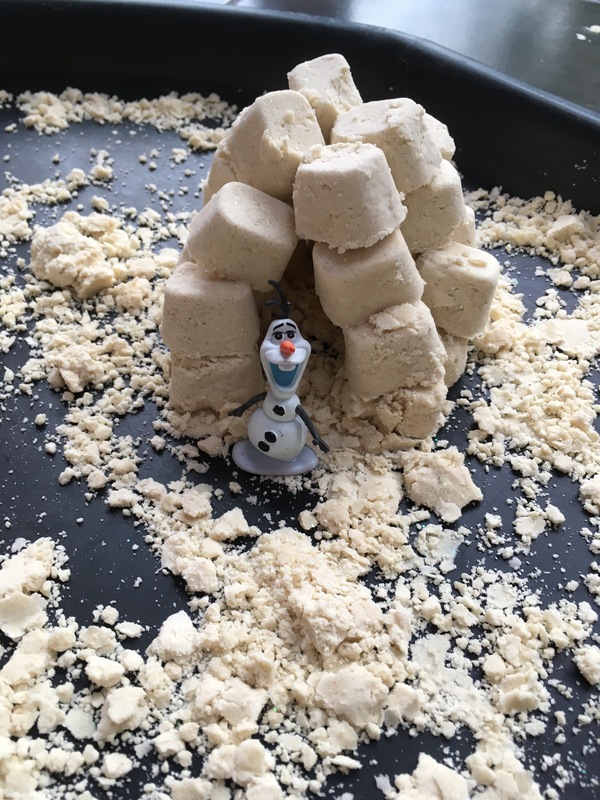 We added some frozen characters too. 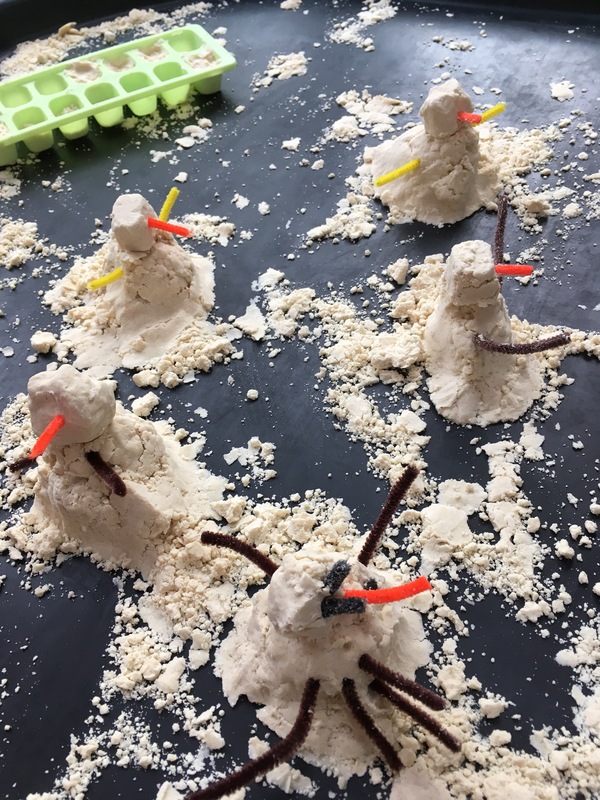 Then we got back to snowman building using the snow blocks as snowman heads. Bobcat really enjoyed adding the pipecleaners and we ended up with a snowman spider! 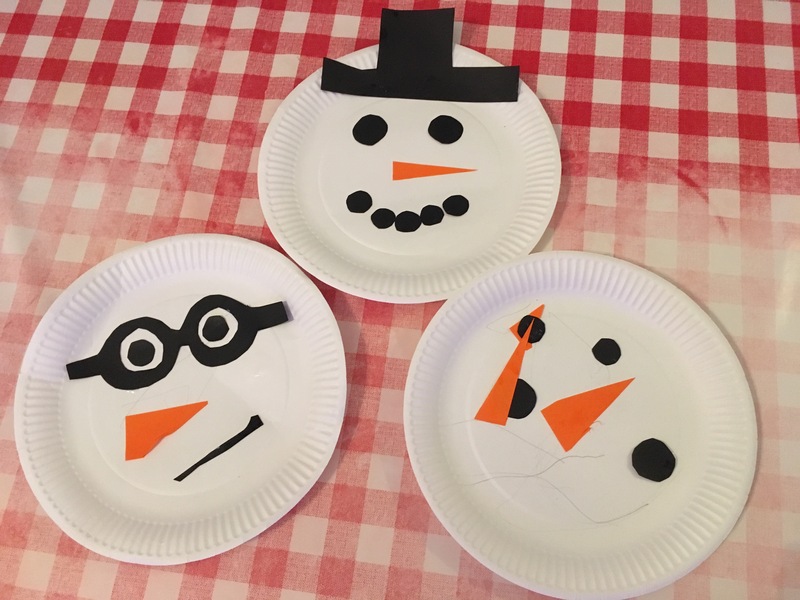 After playing with the snow dough we made snowman faces with paper plates. 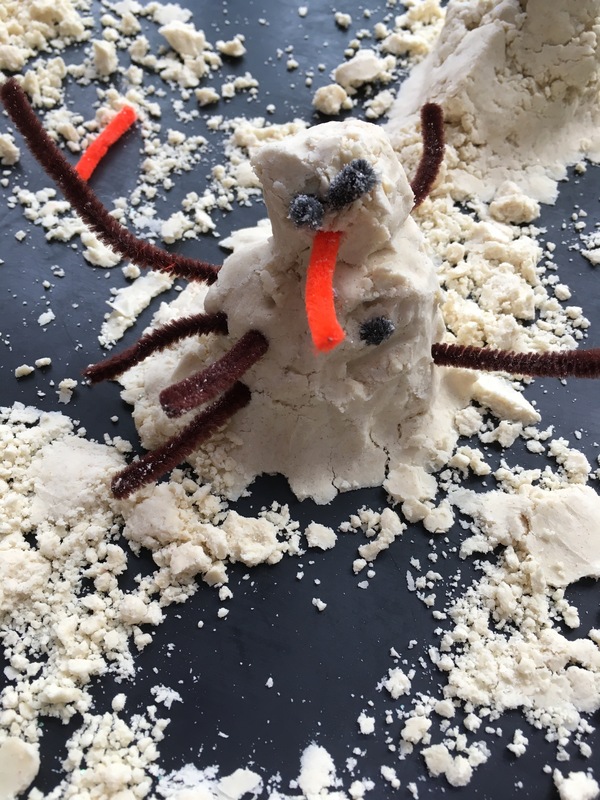 Bobcat enjoyed sticking on all the different parts – he went for the Picasso-style snowman look! 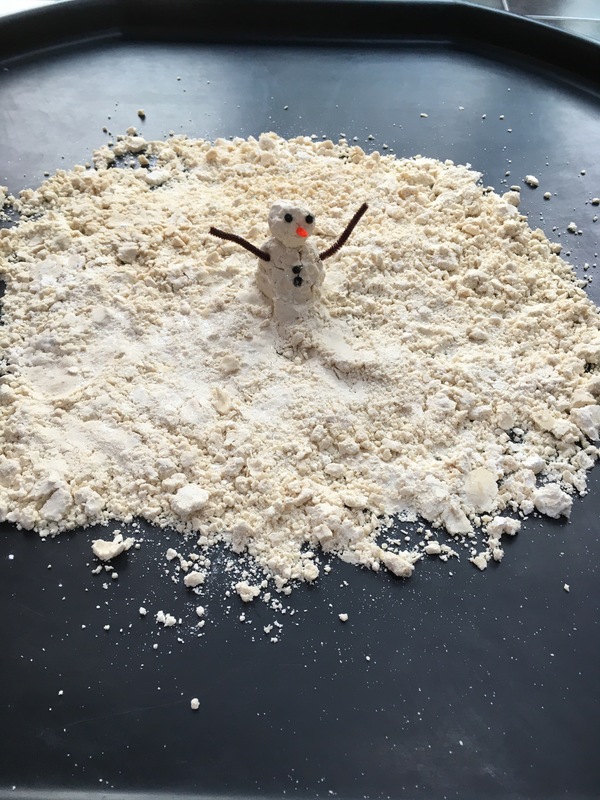 As well as snowman day, our advent activities included making Christmas cookies and Christmas cards. 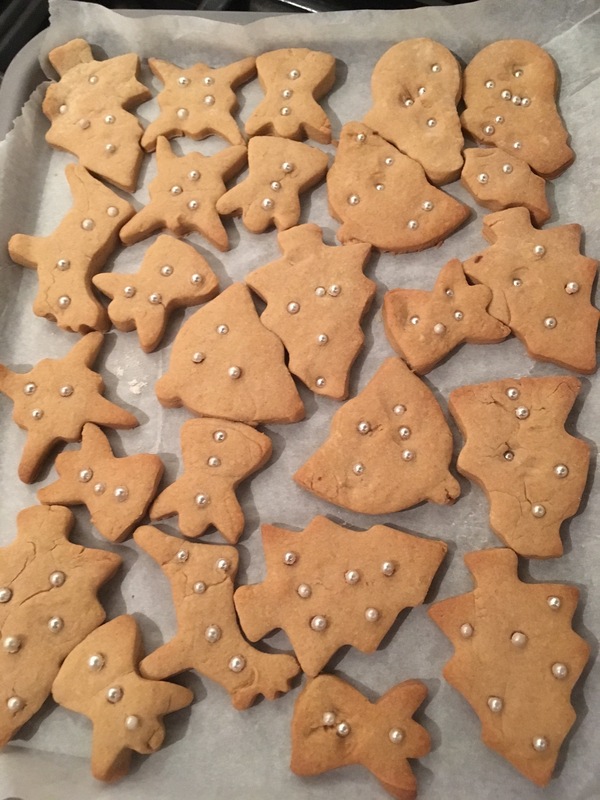 For cookies we always use the recipe from Lessons Learnt Journal as it is really easy for toddlers to join in with. 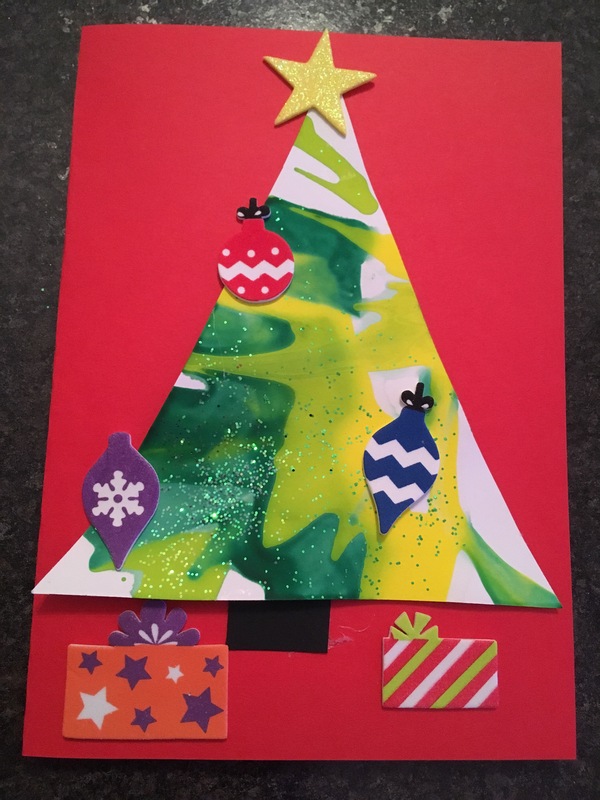 And for our Christmas cards this year we did spin art Christmas trees. 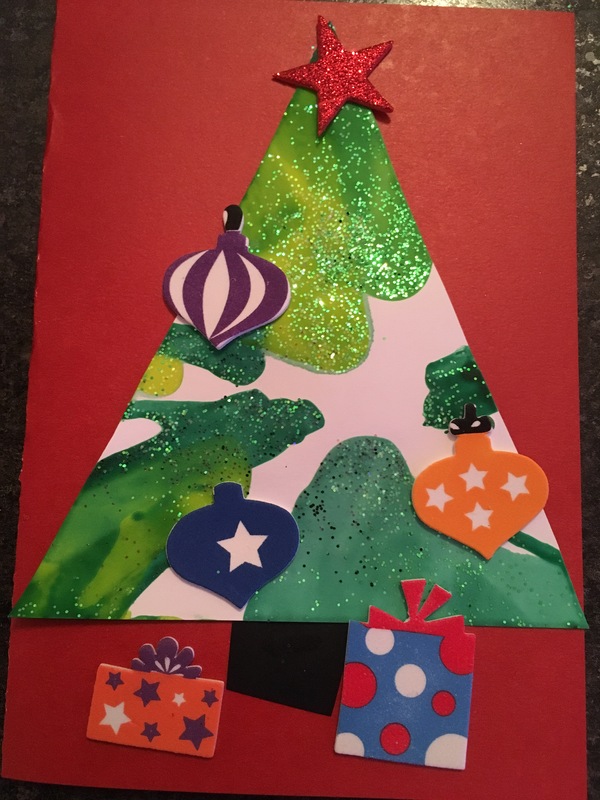 First we made the trees by putting white tree shaped pieces of card in a salad spinner with some different shades of green, white and yellow paint. 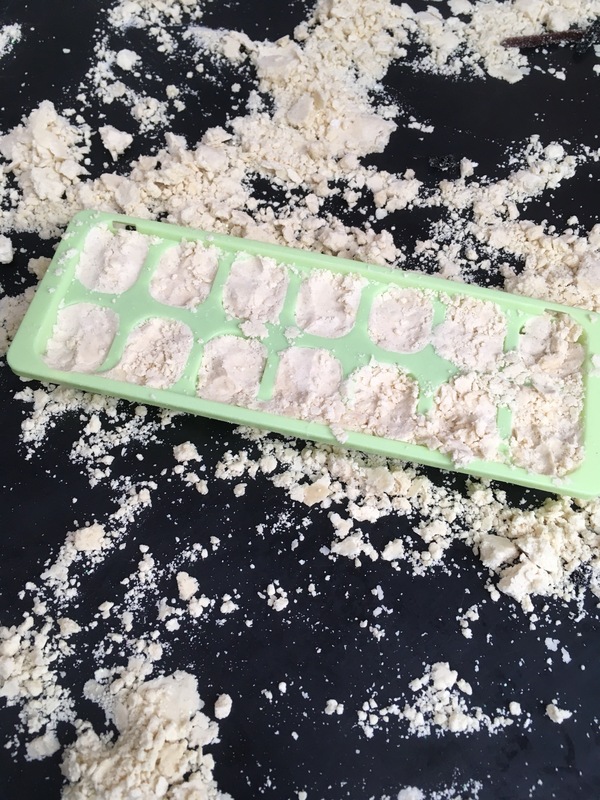 This is a great way to do painting without the mess! When we took them out to dry we added glitter. 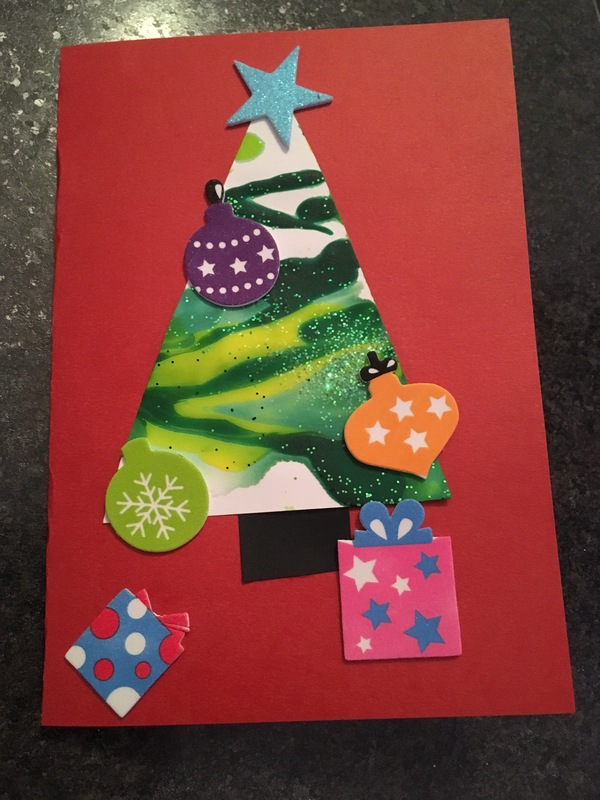 A few days later we stuck the trees to card with some black tree trunks (cutting these out was great scissor practice for Bobcat) and then added star, present and bauble stickers to finish them off. 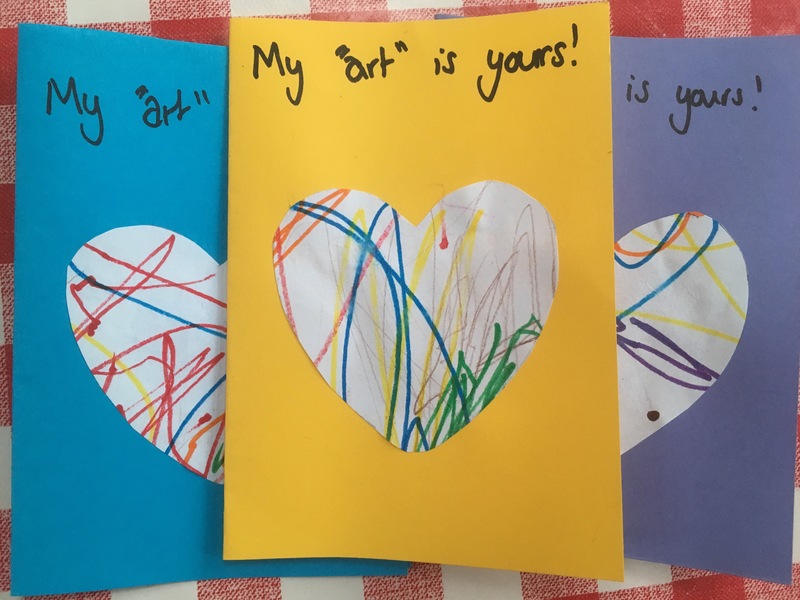 Then in the new year we made thank you cards based on the heart design on Wait Til Your Father Gets Home. I didn’t have a heart shaped hole punch so I just got Bobcat to draw in different colours on some paper and then cut it out into heart shapes.